Arsenal hope to complete the £26m signing of Uruguay midfielder Lucas Torreira from Sampdoria next week. The Gunners have agreements in place with their Serie A counterparts. The 22-year-old needs to undergo a medical and put pen to paper before the deal can be confirmed. The timing will depend on whether he flies straight from Russia to London now Uruguay are out of the World Cup following their quarter-final defeat to France, or travels via his homeland. His arrival will finish off Arsenal’s major recruitment this summer, although they are expected to bring in another younger player before the transfer window closes on 9 August. 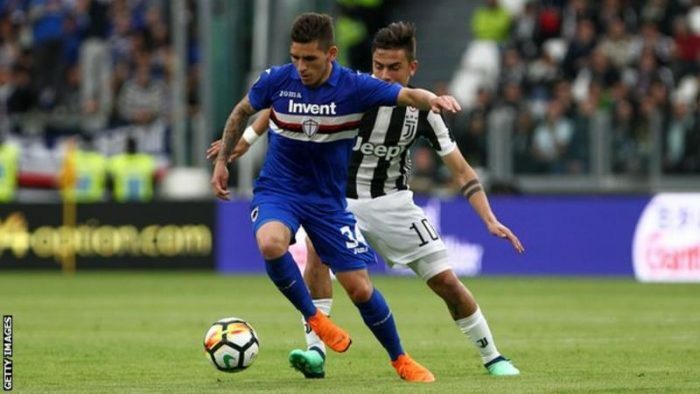 Torreira will become Unai Emery’s fourth signing since taking over at the Emirates. The Gunners have already signed defender Stephan Lichtsteiner on a free transfer from Italian champions Juventus, while Germany goalkeeper Bernd Leno has agreed to join from Bayer Leverkusen. On Monday, Greece defender Sokratis Papastathopoulos joined the club from Borussia Dortmund.